You can go to the local farmer’s market or supermarket or a local grocery store nearby your place to get the fruits. But before that, you must be sure that they have the best produce of fruits. When you are sure about the quality, select the fruits carefully and pick only the biggest one without some bruises or blemishes. Then buy lots of fruits—you can save the fruits for yourself if it is too many. Buy lots of varieties too such as Apples, Pears, Oranges, Grapes, Mango, or even Kiwi; the most liked and favorite fruits. 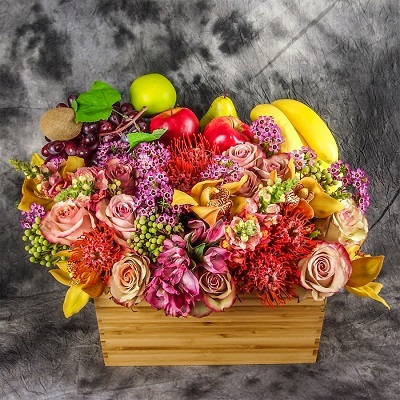 This way, you don’t need to worry whether your recipient won’t like the fruit basket gift, they will absolutely like them! About the basket, choose the one that you think will be fit for the fruits you choose to buy, especially the size of the basket. After you are sure that the size of the basket is enough, you can then think about the style. A simple and cheap basket might be enough, but you need to make sure if the quality is not “cheap” since it is the one that will be left on the hand of your recipient after the fruits are eaten. You can put other items in the fruit basket as an addition and make the fruit basket look more special if you want. Flavored mixed nuts, yogurt, honey, even cheeses, and chocolates will be a good addition to the fruit hamper. It’s best if you know the recipient’s favorite too, add them to the fruit basket, and you will make one of the best gifts they ever receive in their life. A good fruit basket is always wrapped nicely, so you have to do that for your own fruit basket gift too. Buy the materials in the shop and start wrapping! Don’t forget to add your card greeting if you want a more special effect of the fruit basket to the recipient. If you follow all the steps above, you surely can make a good gift that can make your recipient smile.